St. Patrick's Day Kicks: Nike Air Max 90 "St. Patrick's Day"
Released in 2007, the Nike Air Max 90 "St. Patrick's Day" edition made my list of kicks to rock this month. Definitely a more detailed design than the previous two sneakers I posted, the Leprachaunic shoe sports a classic yet vibrant Green colorway throughout. Featuring a light Green upper with a lime Green midsole, dark Green mudguard, and mesh toe box. Brought in together with a hint of Metallic Gold within the Nike Swoosh for effect. The distinctive Four-leaf clover repeating print above the mudguard and gold coin patterned insole bring you the lucky touches of this historic Irish Holiday. 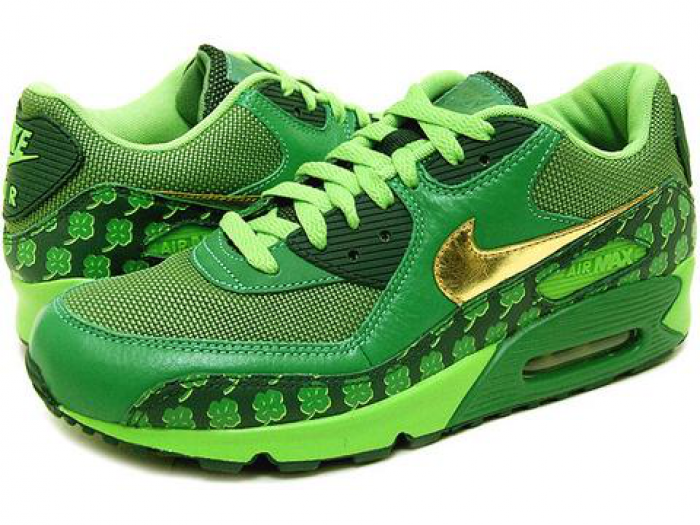 Definitely a head turner if you ask me, everyone is Irish while rocking these on your feet! I love AM90s and you already know they bring ultimate comfort along with style so if you want them in time for the celebrations, get yours on any online sneaker site. Have you seen me lucky charms.. I mean.. kicks? !